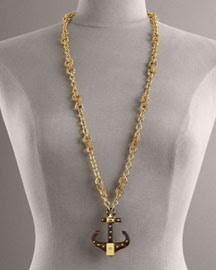 This Juicy Couture gold anchor necklace is now on sale for under $100. The chain is a little too flashy and long for my taste but if I ever find the smaller version (I've seen it before) I am so getting it! Cuuuuute! I agree, I think a shorter version would look better! Nice design!! My sister gifted me a similar designed gold necklace on my birthday. That is pretty big. My fear is that you might start rapping if you wear it! *Laugh* Just kidding. I think a more dainty version would be tres cute! PS - thanks for the swap post!